Winston Walker, now 94, lived through the Great Depression and served in the Navy during WWII. His career in electrical engineering spans several decades of transformational technology, from the first integrated circuits to personal computers and smartphones. However, it was the experience of being a grandfather, and a great-grandfather, that inspired Winston to focus on making the highest quality hands-on science education accessible to today’s students. 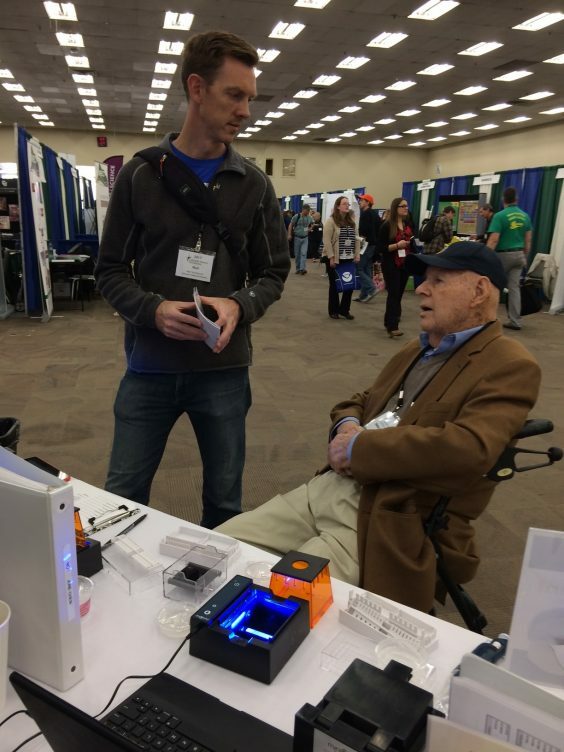 While designing research equipment for Embi Tec in San Diego, Winston learned that a local high school was purchasing the company’s research electrophoresis equipment for biology classrooms. By talking to one of the teachers, he learned that the state-of-art technology was failing teachers in many respects. He came back to Embi Tec with the mission of redesigning electrophoresis from the ground-up to serve the needs of teachers and students. He was 88 when he began this project. Safety, speed, and cost were the most critical parameters that Winston targeted for reinvention of educational biotech equipment. Blue LEDs replaced harmful UV lights, non-toxic fluorescent DNA stain replaced mutagenic ethidium bromide, and voltage was reduced from mover 100 volts to a safe 42V. Precise placement of graphite electrodes and design of the buffer tank increased the speed of separation to the point that DNA could be separated in 20 minutes. These and other modifications combined to create a system that puts discovery in the hands of students, safely and affordably. Most importantly, by building DNA visualization into the electrophoresis unit, students are able to watch the DNA as it runs and document their own results, increasing engagement and ownership of the experiment. His recent design for the MiniOne PCR System followed the same motivation and design principles. The electronic design and control algorithm is optimized for speed with the goal of having students complete a reaction in a single class period. 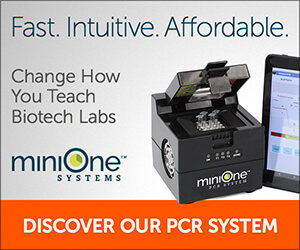 As with the MiniOne Electrophoresis System, Winston has been persistent in lowering the cost of manufacturing to make PCR accessible to more schools. With both PCR and electrophoresis in the classroom, students can engage with authentic end-to-end molecular biology investigations. And we have no reason to think that he will stop here in his mission to reinvent educational biotech equipment. 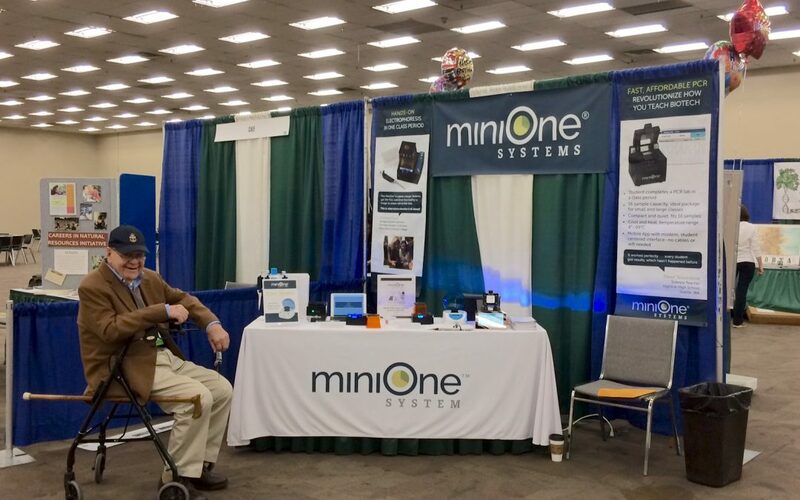 The picture below features Winston himself showing MiniOne Electrophoresis and PCR Systems to teachers at a recent conference in Denver. Every detail of the MiniOne comes with a story of challenges overcome through technological innovation, and with Winston telling the story it can’t help but inspire future generations. If only we could all be so creative and productive in our mid-90s!